Find a huge selection of jasper, moldavite, brazilian agate, onyx, amethyst, geodes, petrified wood, fossils, minerals, natural copper, pyrite-fools gold, fluorite, malachite, dinosaur figures and more. 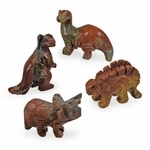 The gemstone mining party supplies creates a perfect educational activity for kids, teaching them about evolution of our earth. They bring home the real gemstone! 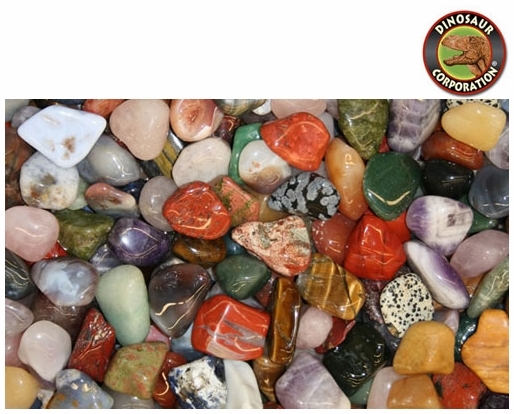 Gemstone Birthday Party Supplies could go extinct at any time, so be sure to order today and take advantage of our speedy same-day order processing and our FREE shipping offer on qualifying orders. T-rex Dinosaur Gemstone Handcrafted Figure, 9"
Triceratops Handcrafted Gemstone Dinosaur Figure 6.5"
Apatosaurus Handcrafted Gemstone Dinosaur Figure, 9"
Brachiosaurus Figure Onyx Dinosaur 8"
Brachiosaurus Gemstone Onyx Dinosaur Figure, 8"
Large Agate Blue Crystal Geode 9"
Agate Geode Crystal Bookend 6"
Brazilian Agate Geode Bookends 6"
Large Geode Blue Bookends 5"
Brachiosaurus Gemstone Dinosaur Figure, 2"
Triceratops Gemstone Hand Carved Figure 2"
Prehistoric Brachiosaurus Jasper Figure, 2 1/2"
Brown Jasper Gemstone 2 1/4"
Gemstone Brown Jasper 2 1/4"
Gold Jasper Gemstone 2 1/4"
Large Brazilian Agate Natural Gray Geodes 6"
Large Brown Agate Geodes Book Ends 8"
Polished Brazilian Agate Slice 5"
Polished Brazilian Agate Slice 5.5" x 4"
Buffalo Animal Onyx Carved Figure, 4.5"
Penguin Gemstone Jasper Animal Figure, 2.5"
Dolphin Rose Quartz Figure, 3.5"
Happy Pig Carved Jasper Figure, 2.5"
Large Buffalo Gemstone Onyx Figure, 5.5"